Honestly, I am a nerd. A professor type who is still a child that loves science and medicine. Long coat, gray hair: I’m sure that you can imagine it. As part of the professor of medicine gig, I love to teach and share what I know with others—from other professionals to medical students as well as high school students (absolutely love teaching high school students). I love to teach because of the possibility of enriching someone else’s life is huge for me; a real gift. And then that person makes the teachings his or her own and does the same for someone else. Teaching evidence-based science that raises the quality of life for many others because they use the science. Very cool. So, you may ask, what does this have to do with kindness? Most people are good. Most people are kind. About 5 years ago, I became depressed after reading the news a lot. And when I realized it was due to how much of mainstream news I was reading, the nerd in me began to study it. I learned a lot—about how the images and stories we see and hear about impact us. How easy it is for photographs of negative things—violence, greed, conflict—to make people anxious, fearful, stressed, or depressed. I thought (and still do) that how the news represented the world wasn’t right. Most people are good. Most people are kind. Most love their families and treat others with respect and tolerance. While the vast majority (including myself) are not kind to the level of Mother Teresa (or pick your own favorite humanitarian), there is good inside so many people. And because of the pressures of modern life, especially with the torrential flood of negative news, I worried that could make people less kind. All of this could disconnect them from even their own communities or families. That meant people would not be able to enjoy the full potential of a human life. So how do we change that? How do we help people reconnect to the essence of being human in a quick and non-judgmental way? It made me think that if we could rebalance what people saw we could help inspire them to be even kinder and to be able to see and appreciate kindness. in the pursuit of a kinder and happier world. I loved photography since I was 6 years old and know the immense power of an image to tell a story and transcend the limitations of language. I thought: what if we could share images of kindness, compassion and empathy from around the world with people? Share their stories and experiences? And that’s how Envision Kindness was born. With crucial help from my eldest son, Jesse, we co-founded Envision Kindness a non profit to promote kindness, compassion and empathy through image-based stories, in the pursuit of a kinder and happier world. As Jesse and I worked on Envision, the nerd in me continued to show itself. I began studying the biology and psychology of kindness. And wow—it became really clear that kindness wasn’t just a nice and moral quality. It was baked into our biology. You can see it in toddlers and in many species of animals, including insects. Darwin referenced it as key to survival of a species. And when I learned that people who volunteered regularly had death rates 20-40% lower than those who do not, I was floored. are strongly benefited by kindness. All this biology meant that people’s mental AND physical health were strongly benefited by kindness and that kindness isn’t just a “nice or moral” thing to do, but as influential to their health as clean water or vaccinations. This is huge. And then I realized that this is why I became a doctor. People’s health could benefit in so many ways from kindness. 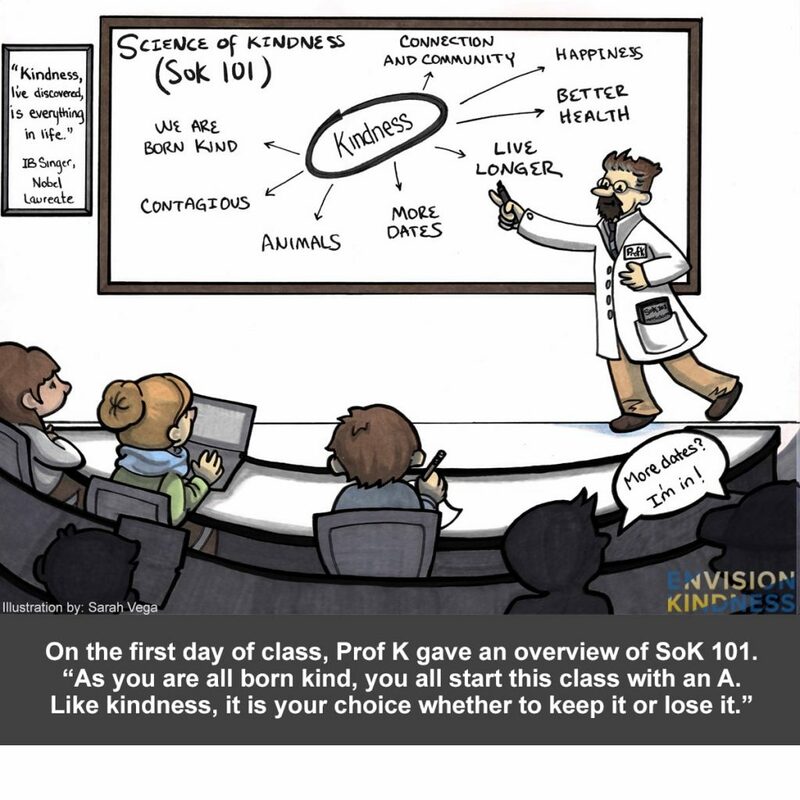 So in addition to developing these programs to gather and share images and stories of kindness, we have created this blog—to give to people the science-based view on why kindness is so important to our lives. Really powerful stuff to know.